Oh, joy of joys, Totem opened last night, in front of an undulating crowd of around 400 people. I was so happy! The show itself looked incredible, and there really was a never ending crowd of people peering into the space. We took photos, but I don’t have a camera cord to upload them at the moment (I’ll be getting it later tonight) so in the meantime, pop by the lovely Poppalina‘s blog to see a couple of photos and a beautiful story about the night. I promise my photos will be here soon! 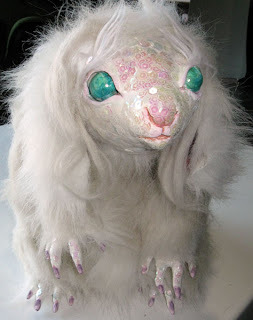 In other Totem news, we sold our first Totem doll last night too, the lovely Erin Hall sold her beautiful little white animal, which I was so pleased about. I know if I show TOO many photos of the dolls that no one will bother going to see the exhibition, but I have to post a photo of Erins’ sold doll. And I have to say, it’s the best use of sequins I have EVER seen. So go Erin! I thought Totem up in January, but it was only June that I got the word from Fed Square that they wanted it, so I then had three months to pull it all together. It was a huge job, and I’m exhausted, but it’s an incredible exhibition and I’m very, very proud of it. Today, the day after the opening, was supposed to be a gentle day, a day to unwind, maybe tidy up a little, potter around the house, that sort of thing. Instead I’ve come up with 2 exhibition ideas for next year. Sighs. But they’re going to be cracking good fun! Stay tuned for news on those, and photos from the opening!